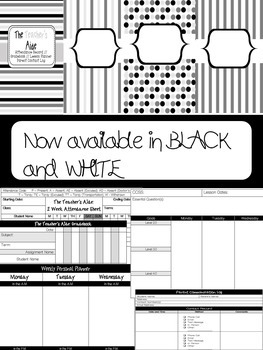 This version of the product now includes B/W main cover & section covers, B/W printables, and editable covers (accessible via Powerpoint). This also comes equipped with a Weekly Planner, as well as a monthly calendar spanning from August 2015 to December 2016. 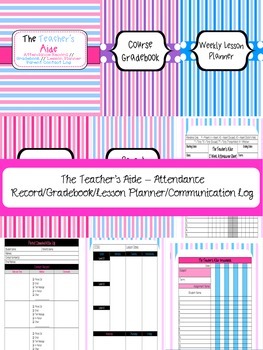 Tired of spending money every school year on record books and lesson planners? 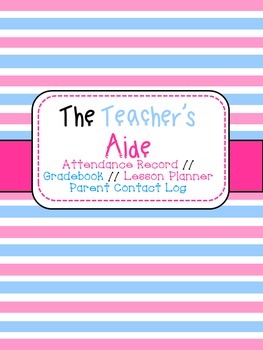 Introducing the Teacher's Aide - a printable attendance record, grade book, weekly lesson planner, and parent communication log. Just print out the pages, hole punch on the sides, and insert in 3-ring binder. Need extra pages? Just print some more! All files are in PDFs, EXCEPT for the editable covers file, which is a PPT file. Please don't forget to rate this product, and leave any constructive feedback. Thanks!